Learn What Local Expectations Are. Watch as many professional performances as possible in local restaurants and shisha clubs to learn what methods the established pros use to gather tips, and to see how they handle unruly audience members. Learn About the Specific Place's Policy. Some restaurants or shisha bars may have very specific policies surrounding how dancers collect and accept tips. Some might even ban it. Before you perform in a certain place, ask an experienced dancer who has worked there extensively what the policy is. Taking a basket, tambourine, or jug around with you as you visit the audience for them to put the tips in. Accepting the tip in your hand, then either tucking it into your costume yourself, or placing it in a small "tip bag" attached to your hipband. Placing a basket, jug, or tambourine on the stage with a sign encouraging audience members to place tips into it. Asking the restaurant or shisha bar to put a line item for "entertainer tip" on the credit card receipt. Accepting tips tucked in your costume. Suggest Tipping Via Tent Cards. Ask the restaurant or shisha bar owner for permission to place tent cards on the tables before the establishment opens for business on an evening when you're dancing. If the manager says no, respect that. If the manager says yes, on the cards explain a little bit about belly dancing, and include a brief sentence encouraging the appropriate way to tip you. Plant Accomplices in the Audience. It can be helpful to "plant" a couple of friends or family members in the audience to provide the first couple of tips as an example for other audience members to follow. If using a tip basket that rests on the stage, put a larger bill or two in it ($5 or more). Plan Ahead and Prepare. Plan which method you intend to use to collect tips and bring any necessary items (basket, sign, jug, tambourine, tent cards, etc.) with you to the gig. Know How to Share With the Band. When a live band is playing for you, it's important to know what kind of tip sharing they will expect. Find out in advance what other dancers in your community do when working with these bands. Acknowledge It. When somebody gives you a tip, nod graciously, make eye contact, smile, and say "Thank you!" Don't Beg. It offends audience members if the dancer plants herself directly in front of them and keeps dancing directly at them, suggesting that she won't leave until she is tipped. Customers find that annoying. It's great to visit each table and dance briefly, but if a tip is not immediately offered, move on to the next. Know What You're Receiving. Take a look at each tip as you receive it — in the U.S., at least, most tips are $1 bills, but occasionally you'll receive something larger. If you do receive something larger, you may want to re-tuck it to ensure that it's very secure and won't fall out of your costume before you finish dancing! Remember who gave it to you so you can thank them again after the show. Encourage Children. As you go around for tips, make eye contact and smile at small children. Parents appreciate dancers who make their children feel included in the evening's entertainment, and they often love to take pictures of their children tipping the belly dancer. Other audience members will think it's cute to see a small child tipping you. When They Fall on the Floor. If you should receive a money shower, or if a tip should fall onto the floor, do not stoop to pick it up. It interrupts the flow of your performance and makes you look greedy. If you know someone in the audience, perhaps you can ask that person ahead of time to pick up any tips for you that fall on the floor and bring them backstage afterward. When They Fall on the Floor. In many restaurants, the staff will pick them up and bring them to you after you finish dancing. If a server does this for you, consider sharing the money with him. Keep Performing! Even while making the rounds to visit the audience, you should still continue to dance and continue to entertain people. One option is to keep playing your finger cymbals. However, please be careful not to play the cymbals directly in anyone's ears! Space between tables is usually very limited, but most hip work can still be done at this time, showing audience members how these moves look up close. This is also an appropriate time to invite audience members to get up and dance with you for 15-20 seconds. Crowd Control. You need to have a plan for how to handle audience members who may offer the tip in a disrespectful way. For example, a man may offer the tip in his teeth, or he may reach for a part of your costume that you don't want him to touch. Crowd Control. In my experience, many people just don't understand that certain behavior is inappropriate. In this case, it's better to react in a way that educates the person rather than getting angry. However, if the person seems drunk or creepy, then you may need to react in a way that protects you from harassment. One time, when I was dancing at a birthday party, one of the friends of the "birthday boy" offered a tip to me in his teeth. In this case, he didn't seem like a bad guy, just unaware that this was not an appropriate way to tip a belly dancer. So I stopped dancing, put my hands on my hips, gave him a "mom glare", and waggled my finger at him in a scolding way. He turned red with embarrassment, took the bill out of his mouth, and politely handed it to me. I gave him an "all is forgiven" smile and resumed dancing. The other party guests thought this was all highly entertaining. They then pressured the "birthday boy" to put a bill in his teeth, because they wanted to videotape me giving the him a mock scolding like the one I had given his friend. It was all in good fun so I went along with the joke. They believe that it makes the public confuse belly dancing with stripping. They believe it leads to disrespect for our dance form. They point to the fact that flamenco dancers and ballerinas don't accept money tucked into their costumes. Some dancers dislike the idea of letting strangers come so close to them. I can see these points. 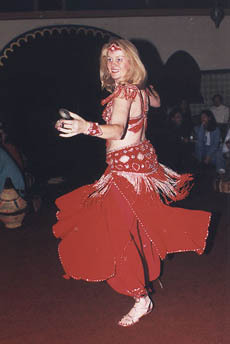 My own belly dance teachers trained me to accept in-costume tips, and they taught me how to do it in a way that would maintain my comfort level. I never had a problem with it, but I have listened to opinions from other dancers about it, and I understand their concerns. Some communities still expect and encourage in-costume tipping. If this is true of your community, here are some ways to manage the tipping process to demand respect, maintain your dignity, and minimize possible bad behavior from the audience. Receiving Tips from Strangers. When I used to accept in-costume tips, if the tipper was a stranger to me, I usually directed him/her to place the tip in either the sides of my hipband or in my armband. Receiving Tips from Friends. If I knew the tipper, I would accept the tip from him/her in the back bra band, center back of the hipband, or the side front of the hipband. Where Not to Accept Tips. I never accepted tips in the bra cups, straps near the cups, or center front of the hipband, even if the tipper was someone I knew very well. I didn't want other audience members to see me receiving tips there and think I'd let them do the same. Body Language. Use your body position and hand gestures to guide customers on where to put the tips. For example, turn your side to the tipper and point to your armband. Using Humor. Occasionally play a game with the tippers. As they reach for the hip to tuck the tip into the belt, suddenly do a hip move to pull the hip away. Then offer the hip back to them, then pull it away again. Do this no more than once or twice during a particular show, because any joke loses its humor if done to excess. Maintaining Boundaries. On the rare occasion that someone tried to insist on placing the tip somewhere unacceptable, I backed away, wagged my finger at them as if scolding with appropriate facial expression, and did not accept the tip at all. Dealing with Drunks. Avoid tables whose diners seem to be drunk or in a heckling mood. Dealing with Drunks. If a tipper's behavior seems drunk, creepy, or aggressive as he approaches, dance away quickly without accepting the tip. The small amount of money offered by these people is just not enough to be worth sacrificing your dignity. Explore other articles related to accepting tips and relating to audience members. Dear Shira: What About Collecting Tips When I Dance?